Everybody wants to be successful. And if you've ever told anyone that you're writing a novel (or screenplay, short story, comic book, rondel, etc.) you'll find out that most people you know are writing or planning on writing or want to write something too. This means there are a lot of people who want to be successful writers out there. But getting published is hard. Basically, new writers have to be better than the people already published. When I read slush as an intern at big publishing company, my instructions were to give the editors the pretty amazing pieces so they could write personal rejection letters. And even if a book does make it out of the slush and into the hands of an editor, writers are often asked for major revisions and rewrites with no guarantee of purchase or publication. If a book makes it past these hurdles it will still be 1-2 years before it hits the shelves. So it's understandable that people might want to skip the whole publishing thing. I wouldn't want my fate in the hands of an unpaid college intern if I could help it either. This leads a lot of people to self-publishing. Once a sign of slightly deluded grandiosity, self-publishing now looks like a reasonable move for writers. For some, it's better than reasonable. Ridley Scott and 20th Century Fox just bought the rights to Wool a self-published sci-fi novel by Hugh C. Howley. That's pretty successful any way you slice it. 50 Shades of Gray by E.L. James started life as Twilight fan fic before being self-published and becoming a huge success. Amanda Hocking's self-published YA fantasy titles have earned her millions of dollars. "More than a thousand [self-published] authors now each sell more than a thousand copies a month, some have already reached hundreds of thousands of sales and two have already joined the Kindle Million Club." Amanda Hocking, queen of the self-published. In case you're wondering, the Kindle Million Club's self-published members include Amanda Hocking and John Locke, who is not the philosopher but a thriller writer from Kentucky. 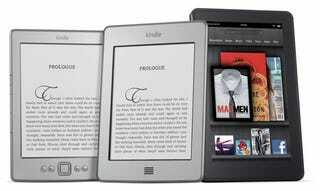 Most of the Kindle Million Club, however, is made up of traditionally published authors like George R.R. Martin, Stephanie Meyer, and James Patterson. Heather Killough-Walden whose 500,000 sales of her paranormal romances garnered her a book contract. J.R. Rain, a fantasy author, who has sold some 400,000 copies of his novels. Tina Folsom's 14 paranormal romance titles sold 300,000 copies in 2011 alone. B.V. Larson, who writes both sci-fi and fantasy, has sold some 250,000 copies of his 25 titles. H.P. Mallory has sold 200,000 copies of her paranormal romances. David Daglish's fantasy novels have sold 175,000 copies. Ellen Fisher, whose first book was published traditionally before she struck out on her own, has sold 100,000 copies of her paranormal and normal romance novels. Michael Sullivan's historical fantasy novels have sold 90,000 online copies and have now been republished by Hachette. There are others, like 16-year-old Rachel Yu who has sold or "rented" out 60,000 copies of her offbeat children's books. Paranormal romance writers Denise Grover Swank, Penelope Fletcher and Sarra Cannon have each sold about 60,000 copies. Much like in traditional publishing, romance novels (including the paranormal kind) sell best. "wanted to reach more readers." Quite the statement from someone who's reached hundreds of thousands of readers already. There's also the fact that since 2008, there have been more self-published titles than traditionally published ones. In 2009 there were 764,448 [ self-published books. ] Without some way to tell that the books are good (or readable or not plagiarized copies of [plagiarized copies of Bram Stoker's Dracula ]) readers face an increasingly difficult time trying to figure out what to read. Self-publishing has very few sign posts for readers; if you pick up a traditionally published book you know an editor not only liked a book, but managed to convince several layers of editors, publishers and marketing people to like it too. The self-publishing landscape threatens to become a vast wasteland for authors too. They have few ways to get recognition and little to no support. They risk spending years trying to sell books no one seems to want, when a good editor or few more drafts could have made the books successful. Widespread and successful self-publishing is relatively new. It's possible that many of the bugs in the system will soon be worked out. It's also possible that some combination of traditional and self-publishing will eventually be seen as the norm and writers will move easily back and forth between the two depending on the project. After all, William Blake was a self-published author. Who was penniless when he died.